Incorporating sites equipped with legacy remotes into your existing network can be a hassle. You may consider replacing the legacy RTUs with more current models. However, multiple new units hurt the bottom line. Replacing equipment at remote sites is costly and takes up precious time. This is especially the case when your remote sites are difficult to access (think helicopter trips, icy roads, snow drifts, etc.). You might also consider a new master station that has legacy capabilities so as to avoid replacing multiple units at your new remote sites. However, this too is less than ideal. Now you have multiple interfaces to monitor at the master station level. Multiple interfaces means juggling different alarms on different systems. It's only a matter of time before you miss an urgent alarm. T/Mon's multi-protocol support has helped companies solve this problem with ease. With over 25 protocols supported, the T/Mon allows you to incorporate legacy devices into your network while also positioning you for evolving network technology. Consider the case of your energy company acquiring a smaller company which was monitoring its network using legacy RTUs. With T/Mon, these newly acquired remote sites can be seamlessly brought into your company's pre-existing monitoring system. Should you choose to incorporate new RTUs into your network at a later date (consider the NetGuardian 832A G5), these too can be easily added to your monitoring system. With T/Mon, maintaining your company's unified monitoring umbrella becomes easy. 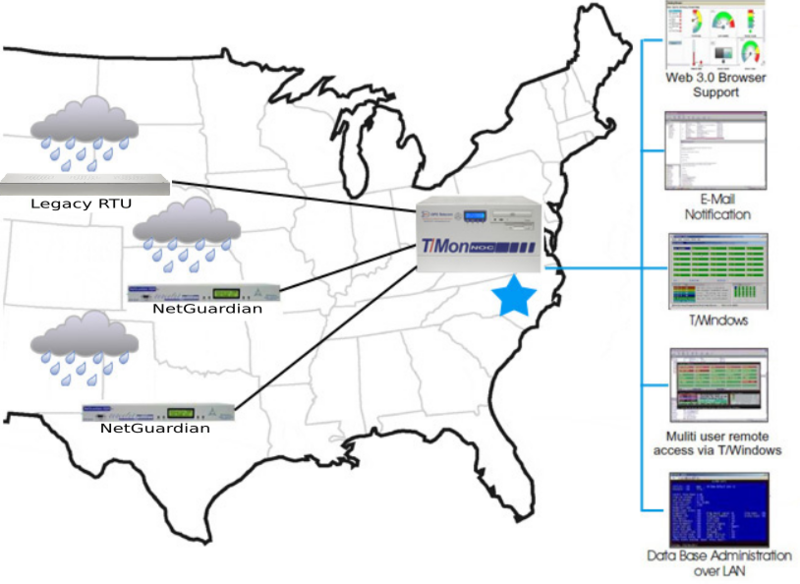 NetGuardians and legacy RTUs monitor conditions at remote sites. Your energy company receives comprehensive network reports from a single source. Incorporate legacy RTUs into your network monitoring system today with T/Mon. Give DPS a call at 1-800-693-0351. Our expert engineering staff can provide a custom fit solution just for you.